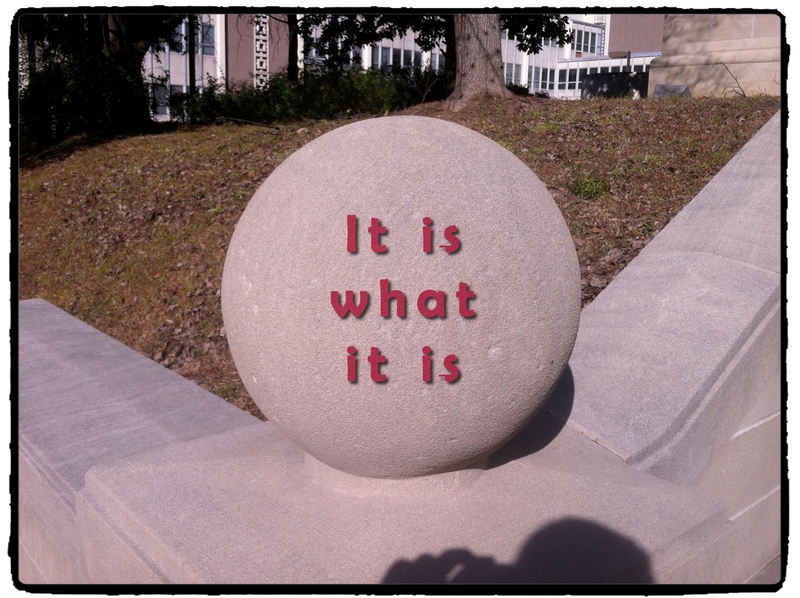 “It is what it is” and the meaning of life. I was tired, so I sent my shadow to take this picture. Janelle and I have a difference of opinion about the meaning and implications of the phrase “it is what it is”. The interesting thing is, we’re both right – it’s all about perspective and experience. In Janelle’s experience, this phrase has been used as resignation, and many times as an excuse NOT to change. She has heard the phrase used in this manner so often that she is sick of hearing it. Well, you may not like how I’m acting, but it is what it is. Nobody likes being mugged at gunpoint, but I need some heroin, so I’m really sorry, but it is what it is. For me, the phrase is actually an inspiring reality check, and the reason is that I had a job for five years with a boss that I really admired, and he used this often, and in this way. So we’re five people short at work, and we have to get 26 flights loaded on eleven different ramps, and keep them all guarded. It is what it is. Let’s get moving. Basically, in my interpretation of the phrase, we are saying. This is reality, we can’t change reality, and we can’t change the situation – but we can change ourselves and challenge ourselves, and figure out a way to get this job done. I like my perspective on this commonly used phrase much better than I like her perspective. This should be very surprising to exactly zero people. Janelle still hates when I use the phrase, but like I tell her, it is what it is. Posted on March 17, 2014 October 25, 2016 by Matthew A BennettPosted in EssaysTagged contradiction, expression, inspiration, it is what it is, language, meaning, not really the meaning of life, phrase, resign. Next Next post: What do you desire? Go and do THAT!